One destination that's been on the radar for E.ONs is out at Bawdsey. Admittedly the full wit of that opening sentence is best appreciated by those with a working knowledge of pulsed operation aircraft detection, the history thereof: go read more here. We haven't done it until now 'cos of its awkward placement -- nobody's fault -- on the dark side of the River Deben. But heck, sun's out, it's July, so let's take an official half-day and by gosh do the darn place. Meeting up in that Woodbridge around 1pm, we saddle up and set the cycle-nav for, er, somewhere else altogether. Andy suggests that we head out via the recently refurbed Ramsholt Arms. Did I mention the heat? By the time we've done the eight miles to find the Dock Road which leads down to the waterside, I am one sweaty Betty. Thank goodness for a restorative Fentimans orange jigger. Bit nice down here, like an undergentrified version of the Maybush at Waldringfield. Crazy busy at weekends, they say. Back on two wheels -- good practice for Andy's imminent French velo-tour -- and only six more miles to Bawdsey. Mid-afternoon now and we could easily eat that Muntjac deer we spotted near Alderton. 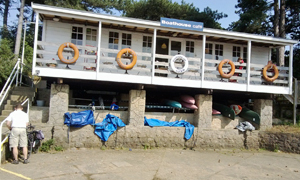 To the left of the international school, it sits: behold the Boathouse Cafe. Up the stairs, in through the back, quick orders placed at the counter and we plonk ourselves outside on the balcony. Cold Coke in a glass has never tasted better and that ham & chutney sandwich, like Andy's pate, didn't touch the sides. That's much better. Cake selection is pleasingly random. Trad scone with jam and cream for him. For me, the affogato (hello Kitty's), no less. Some yum. And because that's not quite enough coffee for now, a latte plus extra shot as well. Zing! Yes, we've been to some lovely places before, but sitting up here in the sun eating nice food and drinking nice drinks sure takes the homemade biscotti. F.A.B. Plenty of seating inside, by the way, 'cos it ain't always this tropical. NB If you fancy a trip, best check the opening hours afore ye visit. How'd I get home? Thanks for asking. While Andy did another eight miles back to Boyton, I took the one-man ferry over to old Felixstowe and did a further fifteen miles home, fading fast. If it was a car -- Hillman Minx 10HP. If they were passing by -- Chris Froome.